A new year brings new concert experiences and what better to think about during the cold and wet winter months than the warm and dry summer festival season? Speaking of which, the ninth annual Sasquatch! Music Festival is fast approaching and its lineup will be revealed in about a month (Feb. 16 to be exact). In the past I’ve prided myself in accurately guessing and sometimes breaking the lineup of the annual Memorial Day Weekend event before it’s announced. Unlike previous years, little has been leaked about this year’s edition of Sasquatch prior to the festival which has made cracking the lineup a difficult task. Currently all that is known is that Pavement will be there and Vetiver is confirmed for the three-day fest. Here’s a look at 20 potential Sasquatch! performers and a guess at the likelihood of whether they will show up at The Gorge May 29-31. Could it happen? : Everyone’s favorite freaky Oklahomans have been a part of Sasquatch three times in the past seven years (twice as headliners) and they have a new album to support. This makes them good contenders to reprise their headlining role, but if they do don’t expect your typical Flaming Lips set. The group’s Embryonic-tinged Dark Side of the Moon begs to be performed live outside of the one-off New Year’s Eve performance last year. The last time the Lips played Sasquatch! they closed the festival down with a U.F.O. show, which was a one-off event in OKC prior to Sasquatch! so there is precedent for a unique Flaming Lips set at Sasquatch! Could it happen? : The reunited Pavement is already playing Sasquatch! so could live Nation and Adam Zacks make it a reunion blowout by adding Soundgarden to the bill? We already know the band is probably only playing festivals this year and Sasquatch! is in the band’s home state so it could happen. Could it happen? : The biggest buzz band around is mysteriously skipping Seattle on its current tour. The last time they were in town they played a 20-minute set in December before Contra was released. Now that it the record has been released it seems like a no-brainer they will be at Sasquatch! Could it happen? : Pearl Jam has never played a home state destination festival and their Gorge shows are epic. Add in the talks of Soundgarden possibly playing a set and Matt Cameron’s PJ/Soundgarden connections and there’s hope for Pearl Jam returning to the Gorge. Could it happen? : These French indie darlings had a breakthrough 2009 and they are playing a show in town in a couple of weeks. Their winter tour is suspiciously short which could mean they are coming back to the states after a brief stint at home so they can play festival gigs this summer. Could it happen? : These guys aren’t your typical Sasquatch! band but they did invade several festivals in Europe last year and their show at the Paramount in November was a rousing success. Factor in Queens of the Stone Age’s appearance at Sasquatch! in 2006 and there could be some mind erasing with no chasing going on at the Gorge. Could it happen? : The songstress is perfect Sasquatch! material. She’d be a great fit for a mid-day slot at the Wookie stage and her tour has no listed Seattle date. Could it happen? : This Brooklyn band with Northwest ties has aren’t strangers to Sasquatch! and they have a record full of cover songs coming out this year. They are another of those bands whose tour misses Seattle so a Memorial Day set in eastern Washington seems likely. Could it happen? : This Vancouver, B.C. duo stated they would be back in town in 2010 to play a festival in the spring during their December show at Chop Suey so they will probably be at Sasquatch! The only wrinkle is that they are also scheduled to be a part of the Primavera Sound Festival in Europe on Memorial Day weekend, but they could play both fests. Could it happen? : For as popular as MGMT is they don’t play nearly enough shows in Seattle. A new album is on the way this year which makes them prime for a long overdue stop in the Evergreen State. Could it happen? : I interviewed Adam Zacks back in 2006 and he told me the two acts he has always wanted to book for Sasquatch! are Bjork and Radiohead. He got Bjork in 2007 but Radiohead has been pretty elusive for the festival. Radiohead isn’t supporting any new releases but the band is unpredictable (case and point: releasing In Rainbows with a week’s notice) and in 2004 their only U.S. show was a festival date at Coachella. Could it happen? : These guys played one of the more well-received sets at last year’s festival and they packed the Moore Theatre in November. Although they were a part of last year’s festival it seems fitting they would make an encore appearance on the main stage in 2010. Could it happen? : Her set on the main stage in 2008 was one of the more memorable Sasquatch! sets in recent years and she reportedly is working on a new album. Her name is being thrown into the Sasquatch! mix because of the new record and her past Sassy success. Could it happen? : When it was announced these French-Canadians are releasing a record this spring summer and touring around the time of its release the festival rumors started flying. They’ve played Sasquatch! twice and they’ll likely be bigger than ever when the new album drops so a headlining slot is a possibility. Could it happen? : Members of the Sasquatch! message boards went crazy with rumors of a Pixies Sasquatch! set when an autographed Pixies poster was announced as a prize to whoever named the comedy/dance tent. 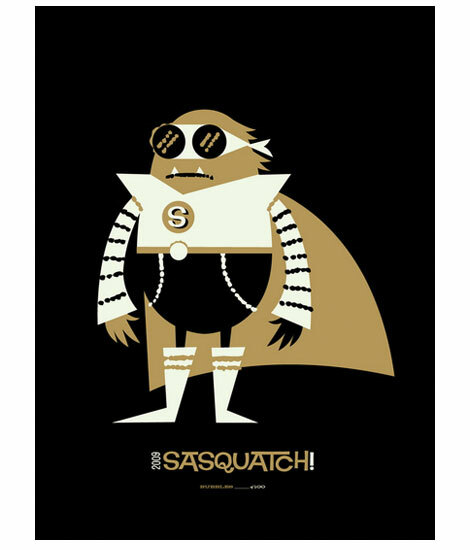 What they probably didn’t know is that the Pixies’ two Doolittle shows at the Paramount were STG concerts (Adam Zack’s day job is at STG) which is likely where the poster came from, so Sasquatch! doesn’t seem likely. Could it happen? : Love them or hate them, Animal Collective are one of the biggest bands in indie music. They have an EP on its way and they have a pretty large following so it seems logical they’ll be a festival circuit mainstay which could mean a slot at Sasquatch! Could it happen? : A late winter concert in Seattle makes them a slight possibility for Sasquatch! in May, however, they will also be a part of the Primavera Sound Festival that same weekend. It’s possible they pull a Japandroids and play both festivals but Wilco doesn’t need the exposure like Japandroids and they don’t seem likely to do such a thing anyway unless there’s a massive amount of cash thrown their way. Could it happen? : Like lots of bands on this list, Dead Weather are expected to put out an album this year. If that ends up happening it would be amazing to see Jack White at the Gorge. Could it happen? : Reportedly Adam, Mike and Adam are ready to hit the road again and support a new album after Adam Yauch successfully conquered cancer. Factor in that the Beasties have played Sasquatch! before, performing two sets in two nights back in 2007, and this could mean a stop at the Gorge in May. Could it happen? : Spoon is playing two shows in Seattle in April which makes them a highly unlikely get for Sasquatch! 2010. So sorry, but even though the band now has PDX ties there’s no chance they will be at Sasquatch! Broken Bells: I don’t think Dangermouse has ever been to the Gorge. This needs to change. Minus the Bear: Another group of locals with a new album out this year who are no stranges to Sasquatch! January 22, 2010 No categorySasquatch!